In the quarter-century of the Pumpkin Pedal bicycle ride and road race, a lot of things have changed. One thing has remained the same – participants enjoying themselves while raising money for the athletes of Special Olympics Illinois Far West Suburban/Area 2. The event on Oct. 2 offers recreational riders and families 10-, 20- and 26-mile trail rides entirely on the Great Western Trail. 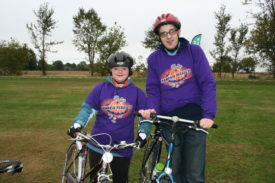 For serious riders, the 40- and 62-mile road rides will be on roads in far western Kane County. “We rise by lifting others” is a mantra that truly described Keith Michael Tyler. Anyone who had the privilege to meet Keith quickly recognized his gregarious personality, his outstanding athletic abilities and his tremendous can-do spirit. Keith competed in 12 Special Olympics sports including his beloved powerlifting and won a bronze medal with Team USA at the 2015 Special Olympics World Summer Games in Los Angeles. However, many people didn’t get to see another side of Keith. 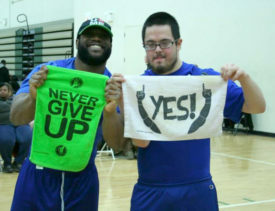 He was also the guy who cheered on and encouraged all of his teammates and gave support to those that needed it. Keith always looked for someone who was struggling and did what he could to help them, even if it meant he had to go out of his way. Keith Tyler passed away unexpectedly on Tuesday, July 19. He was surrounded by family and close friends. This loss has tremendously affected the Special Olympics community not only in Chicago but all over the globe. Anyone who ever had the privilege to spend time with Keith, whether it was a brief moment or an extended time, will remember him fondly. While we remember the athlete, also remember the man: Kind, generous and uniquely positive. Tim Rubens, Athletic Director for the Special Olympics program at the McKinley Community Center, is always searching for ways to strengthen and grow their Special Olympics involvement. Their challenge is often related to resources. So, the McKinley Vocational Panthers was thrilled with the continued support they receive from the University of Chicago Women’s Athletic Association (WAA). The WAA has shared financial contributions during the past two years which have allowed the Panthers to acquire new athletic uniforms and equipment and has assisted with costs of lodging when the Panthers compete outside of Chicago. The most recent donation of tennis racquets, tennis balls and tennis nets from the WAA has allowed the Panthers to improve and expand their tennis participation with Special Olympics Illinois Chicago/Area 3. Panthers athlete Cornell, seen in photo, is advancing to the state level competition in August! 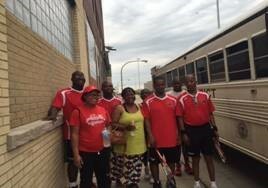 Coach Rubens said that support from the WAA helps his team reach greater athletic heights. “They have made a contribution to a sports program that, with just a little assistance, continues to bring home gold medals and championships, despite the obstacles that our athletes overcome daily,” said Rubens. Teneo Hospitality Group, a global sales organization representing more than 300 member hotels and resorts, hosted an event in Chicago during the week of July 18. Teneo’s Midwest team provided a forum for their hotel members to network with meeting planning professionals. As an added benefit, each attendee had the opportunity to participate in sharing a donation with Special Olympics Illinois. Each attendee received a backpack to fill with various school supplies and hygiene products provided by Teneo. Teneo, with the help of clients at the forum, donated 150 backpacks to the Chicago program of Special Olympics Illinois. The backpacks were shared with Ada S. McKinley Community Services, an agency which participates with Special Olympics Illinois. Celebrating its 10th year, NELARUSKY has become one of the premier launch parties for Chicago’s Lollapalooza. 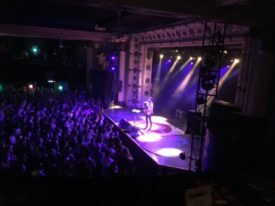 Since its launch, the event, which is held at Metro in Chicago, has featured bands including Imagine Dragons, Icona Pop and Alabama Shakes. NELARUSKY 10 didn’t disappoint fans at the sold-out concert. Bands Wild Child and Marrow entertained more than 1,000 audience members before headliner City and Colour took the stage for a solo show. Event organizer Lauren McClusky invited Special Olympics Illinois athletes Barbara Kozdron and Christine Maxwell to join her on stage and introduced them to the audience before she announced the amount of the donation. The proceeds from NELARUSKY amount to $30,000 and will once again be shared with Special Olympics Illinois. 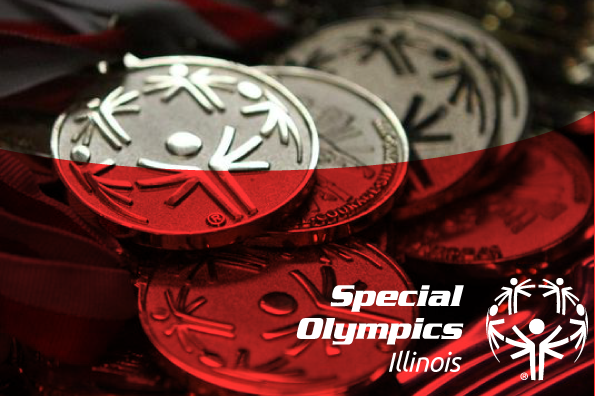 Kathy McLaughlin, Director of Development for Special Olympics Illinois, accepted the check and acknowledged the hard work, dedication and enthusiasm that Lauren and her team demonstrate through the months of planning. Jennifer Fortner, Special Olympics Illinois Board Chair, presented McClusky with a gift and shared her appreciation for 10 years of fundraising that she has lead and stated that Special Olympics Illinois is extremely grateful for Lauren’s dedication and passion for Special Olympics. NELARUSKY sponsors included Sterling Partners, Jim Peterick and Walt Disney Studios. Additional contributions were shared by HUB51, C3 Presents, Sidley Austin, Medford Capital, JMA, BMI, the Metro and Do312. 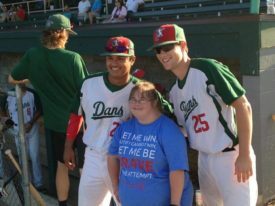 Special Olympics Illinois Eastern Prairie/Area 8 athlete Samantha Beissmann of the Mahomet Area Magic was invited to throw out the first pitch at the Danville Dans baseball game on July 26. This particular game was sponsored by the Danville Buffalo Wild Wings who in June held a fundraiser for the Mahomet Magic team. BWW Manager Scott Roberts invited Samantha to throw out the first pitch and she did just that, right over home plate! Samantha participates in softball skills as well as the local Challenger league, so she definitely had the experience to deliver such a successful pitch. 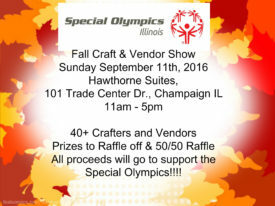 A fall craft and vendor show on Sunday, Sept. 11, with a portion of the proceeds benefiting SOILL Eastern Prairie/Area 8. The show, which will feature more than 40 crafters and vendors, will be from 11 a.m. to 5 p.m. at Hawthorne Suites, Champaign. There will be a prize raffle and 50/50 raffle. From Sept. 1-14, Walgreen’s locations in Central Illinois will be launching a fundraising campaign to benefit Special Olympics Illinois. View list of participating stores. 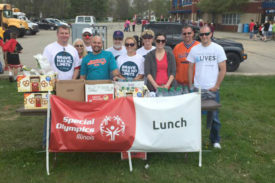 John Davis and his volunteer crew from Walgreen’s serve lunch at East Central/Area 9’s Spring Games. During the two-week fundraising time period, patrons of Walgreen’s stores will be encouraged to purchase a scannable in donation amounts of $1, $3 or $5. Customers can write their name on the donation and Walgreen’s will post it in their stores, as a means of also raising awareness for Special Olympics Illinois athletes. On Friday, Sept. 16, Special Olympics Illinois North Suburban Cook/Area 18 will be joining the Buffalo Grove/Lincolnshire Chamber of Commerce for the 29th Annual Golf Outing at the Arboretum Club in Buffalo Grove. This event is an exciting opportunity to play 18 holes while supporting the local Special Olympics athletes. In addition to golf, the annual golf outing will feature a silent auction and raffle. A portion of the proceeds will benefit Area 18. Registration is now open and sponsorship opportunities are still available. The price per golfer is $150 and includes all course contests, breakfast and lunch. If you are interested in participating in this event please reach out to Kristen Wisniewski, Manager Business Development & Partnerships, Areas 13 & 18, at 847-370-7370. This is Special Olympics Illinois’ second year of involvement with the golf outing. Last year’s event saw 66 golfers and raised $15,000 – a portion of which benefited Area 18.